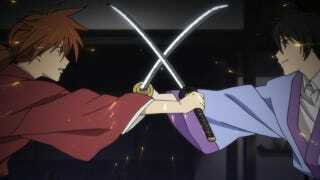 In the Rurouni Kenshin manga and anime, there's a reverse-blade sword called sakabato. An old, real-life version of this fictional sword was apparently discovered in Japan. Last October, what's being compared to a real sakabato turned up in an old family storage cellar, located in Chiba Prefecture's Shiroi City, that dates from the Edo Period (1603 to 1868). Asahi News reports that the entire weapon, which it's calling a "kogatana" (小刀) or "short katana," was covered in rust and measures 11 inches, with the blade measuring 8.6 inches. This reverse-blade, which is also covered with dragon engravings, is different from traditional Japanese swords. For Japanese swords, the outside of the blade is sharpened. But, as this sword retailer explains, the fictional sakabato differs in that the inside of the blade is sharp and the outside of the blade is dull. Apparently, this makes the sword brutally deadly. Supposedly, there was a rare reverse-blade tanto (dagger) called a "kubikiri" or "head cutter." That blade, however, had no point—unlike this latest find. You can see a photo of it here. The Asahi News report appears to indicate that the newly discovered short sword is different and even compares the short sword to Rurouni Kenshin's fictional blade. While there are contemporary sakabato for collectors, there's no record of the sword actually appearing in Japanese history. Until now, it seems there's been no such record of a similar sword. Thus, that makes the discovery of what's apparently an actual reverse-blade all the more interesting. The reverse-blade has been donated to the prefecture's cultural archive.